The post-Millennial generation best known as Gen Z are pivoting away form Millennials. How many people attended March for Our Lives? 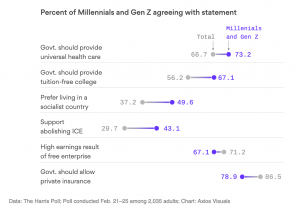 Axios published the results of a Harris poll Sunday which found that Millennials and Gen Z are more “embracing socialism.” Actually, the poll didn’t ask about any particular definition of socialism, it simply asked if respondents would prefer living in a socialist country. Nearly half of Millennial and Gen Z respondents said yes. Does that mean they want the U.S. to be more like Sweden or Cuba? My guess is the former though I’d bet money fewer than 1 in 10 could explain the difference. some of thee kids, during the protests and on TV interviews dropping "F-bombs" with ease, attacking their parents - does that make us proud of our youth? 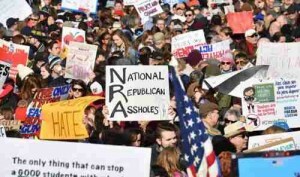 the only apparent purpose is to protest, make general political statements, attack Republicans, attack President Trump and attack the NRA, none of which are obstacles to progress in stopping school violence. this is just another attempt to 'get Trump' by using this 'children's protest' to gen up enthusiasm on the left and to tamp down the national enthusiasm that has been evident since Nov. 8, 2016. The second thought is that all this reminds me of a Nazi style movement. I know, the left and the leftist media will go 'ape-s...' over using that word against a left wing political protest. They can use the term with impunity without one shred of accuracy, but no one can apply it to the left without a violent political reaction. Well, tough, I am going to apply it. The Nazi's spent the 1920s and 30s trying to get people to believe their political narrative. They used emotion, misinformation and propaganda, and later force, to control messaging and dupe the German public into joining their evil Reich. 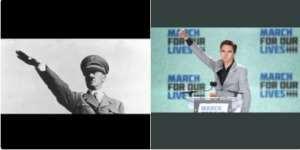 This March For Our Lives, with their broad statements, clever slogans and emotional connections, looked to me to be doing the same thing. So many people buying into propaganda. Marching for a 'solution' that is incomplete at best and totally wrong at worst. And, using emotion as a hammer to beat down anyone who acknowledges the manipulation of these kids and to exclude anyone who wants to offer a more complete solution. If these kids could have a clear and accurate objective and develop a complete solution package and have that be what they are marching for then this 'movement' could make something happen. But, the 'movement' necessary is not on gun control. It is on the leftist media and radical Democrats who fail to recognize a complete solution package that will have impact, not just satisfy their political gun control objectives. By the way, if you want to see hundreds of thousands of young people focused on positive change, go to a World Youth Day.